How committed one is depends on the depth of his love . Some people are not afraid of commitment. They are afraid of committing to someone who won't commit to them. Trustworthiness can be seen in one's action with commitment and honesty. When you make a commitment , you build hope. When you keep it, you build trust. To live life in the true sense is to be committed to your quests and aspirations. 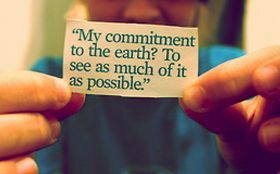 Commitment is cent percent dedication towards the accomplishment of any goal or task at hand. Unless commitment is made, no plan can be executed to perfection. Commitment can be made both on professional as well as personal fronts. Professionally, you make commitments when it comes to taking up any project or tender. Commitments are made regarding completing a project, within a deadline. Similarly, on the personal front, the foundation of a relationship is a commitment that two individuals make to each other. This commitment keeps them together, eventually making them each other's better halves. In the words of Tom Flores, "A total commitment is paramount to reaching the ultimate in performance". If you are committed to any task, it increases your efficiency manifold. Your chances of success increase if you are dedicated towards any particular task and its timely completion. So, take up tasks with total commitment, if you wish to complete them successfully.